Whether it’s a dance-a-thon, a movie night, a car wash, or a gala that you’re planning, Relay Event Rentals has everything you need to hold a successful school or PAC fundraiser. Our beautiful community is important to us, and we proudly give back in a variety of ways. We also offer discounts to groups raising money for a variety of reasons like graduation events, after-school programs, non-profit charities, outdoor education and more. Need help bringing your fundraiser to life? If you’re into giving back, we’d love to work with you. We have the equipment to make your fundraiser happen. 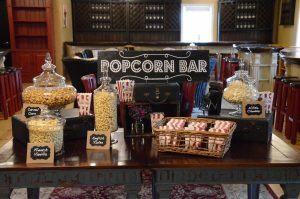 With numerous novelty items like popcorn makers, snow cone machines, hot dog machines and chocolate fountains, your fundraiser is sure to cause some severe fun! On top of dishes, glassware, flatware, linens, and napkins, we also carry a large selection of balloons, paper lanterns, twinkle lights, and disco balls to liven things up. And don’t forget the best part—we always do the dishes for you! Have a cause but stuck for inspiration? We’re full of ideas and will gladly help you find the best way to raise some money! No matter what you’re planning, we have an extensive selection of event rentals, novelty items and creative decorations to choose from. Give us a call at 250-871-4646 or email info@relayevents.ca to get the ball rolling. If you prefer, stop by our showroom at 2-1255 McPhee Avenue in Courtenay, where you’ll always find our friendly, experienced team happy to help you plan your next fundraising event.